First off Happy New Year, I hope you all had fab Christmases and New Years Eve's! I can't quite believe it's 2016 already, how crazy is that! I know I have said this so many times but from now I am going to be blogging more frequently and I am going to schedule my life better ha! 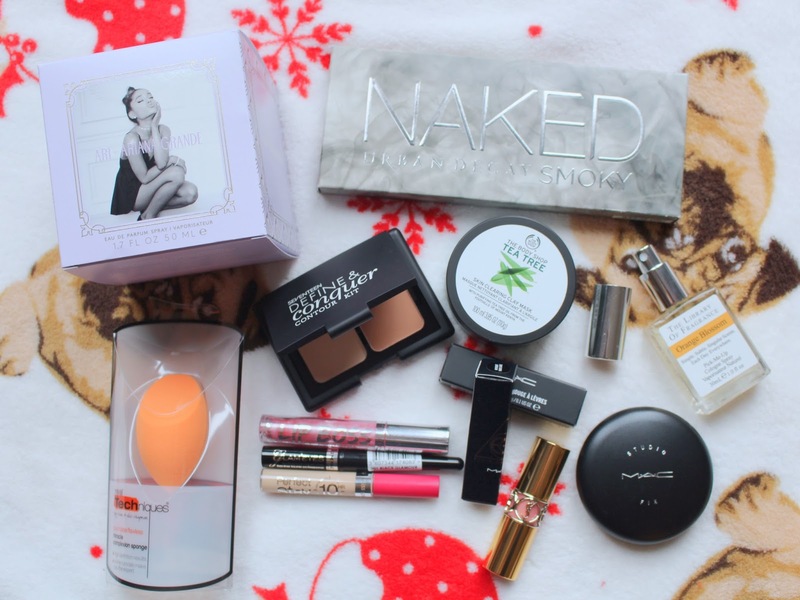 Since it has just been Christmas I was lucky enough to be given a few beauty items and wanted to share them with you (I am not trying to show off in any way, I personally love reading posts like this so sorry if you think it's boasting I promise that isn't the intention). Firstly these are the presents that I received from either my family or boyfriend. I got 4 perfumes, Ghost Girl, Ever Bloom, Princess and Ari. Ghost Girl and Princess are 2 of my absolute favourites and I have just run out of both so was perfect timing. I had a sample of Ever Bloom and absolutely loved it so asked for that and Ari is literally my favourite perfume at the moment so opted for the roll on as it is perfect for putting in your handbag! I was lucky enough to be given the full set of Bumble and Bumble's thickening range, which includes the shampoo, conditioner and hair spray and this is one of my favourite B and B ranges. I also received the Soap and Glory No Clogs Allowed face mask which I'm excited about. Finally I got 4 pieces of make up, I needed more Benefit Roller Lash so got that, 2 MAC lipsticks Velvet Teddy (my new absolute FAVE!) 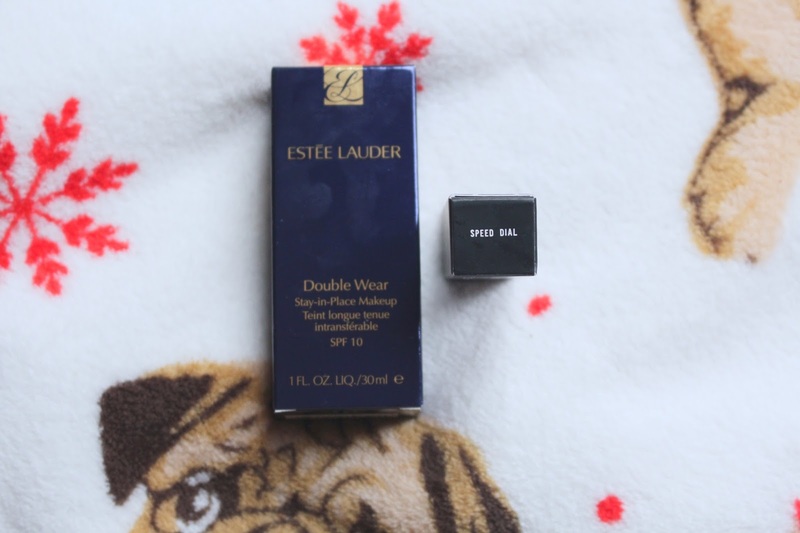 and Speed Dial and finally I got something I have been wanting for SO long, Estēe Lauder Double Wear foundation which I can say is absolutely perfect!!! I have the colour Cool Bone and it is a perfect match. I was so happy about everything and extremely lucky, I can't believe how generous my family and boyfriend were! I was also extremely lucky to be given some money and so I accidentally (yeah right!) went on a bit of a splurge! Since I had the roll on Ari perfume, I decided to get the big bottle of it so I could spray it on my scarves and clothes etc and I didn't know that Boots did The Library of Fragrance and I found my all time favourite scent Orange Blossom which smells incredible, I love it. I finally got my hands on the Urban Decay Naked Smokey palette, which I have been dying to use but I wanted to photograph it first so now I finally can!!! In Boots I picked up a new Real Techniques make up sponge, because quite frankly mine is absolutely gross and broken, the Miss Sporty 10 hour stay concealer in light, Rimmel Glam Eyes liquid eye liner, Barry M Lip Boss lip gloss in 3 (it does have a name but I can't remember it Office Romance maybe?) and the 17 Define and Conquer contour kit. From The Body Shop I got myself the Tea Tree Clay Mask which is so refreshing and really lovely. Finally I got myself 3 new lipsticks; MAC Please Me, MAC Ellie Goulding edition Without Your Love and YSL Rouge Volupté Shine in 8. Finally, I also got myself a MAC Studio Fix powder in N4. So those were the things I was given and purchased myself, like I said I am beyond lucky to be able to buy these things and also be given these lovely presents, I am so grateful! I can't wait to try everything out! Oh and in case you were wondering the pug rug is from Tesco, and I got it from my boyfriend! 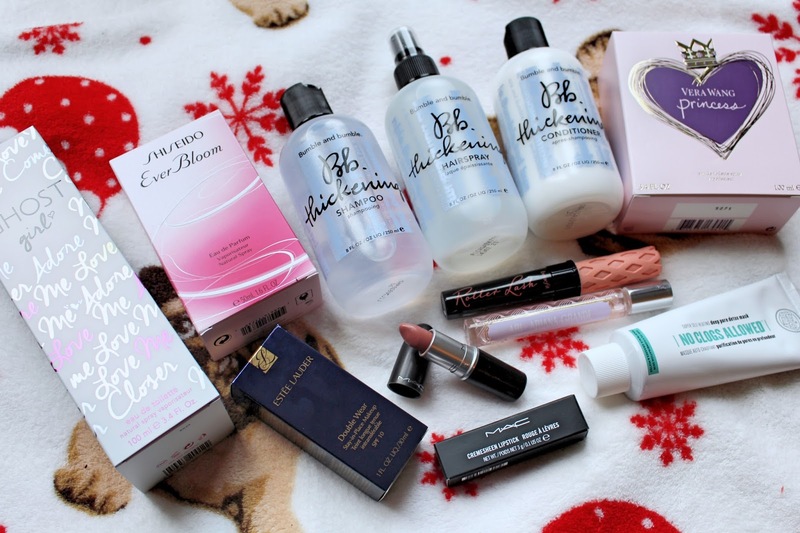 What did you guys get for Christmas?! You'll love Roller Lash it is gorgeous! Made me giggle when you haven't been able to use until you photograph it hehe! hope you had a lovely christmas! Roller lash is a product which got hyped up for quite a while but I've forgot about it until now! Ok, can we talk about how Vera Wang's Princess smells like heaven in a bottle? I'm obsessed! Great post Katy!